Raj Filters is the most leading company for Brass Wire Mesh production. Brass wire mesh is an alloy of copper and zinc. It has much better abrasion resistance, better corrosion resistance and lower electrical conductivity as compared with copper. 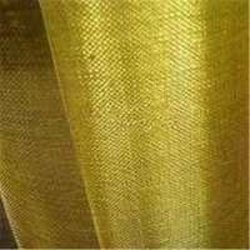 Our brass woven wire cloth products are widely used in mining, petroleum, chemical, electronic, transport, plastic, food, construction and other fields. The chemical composition of brass is 60-70% copper plus 30-40% zinc. Brass is superior to copper wire mesh in abrasion resistance and tensile strength, but electrical conductivity of brass wire is considerably lower than that for copper wire. Brass mesh is fairly stiff, but it can be bent by hand and easily cut with tin snips and common scissor.